The parallelogram of power with which we are all familiar defines the proper fore-and-aft alignment. But there is also a lateral alignment that is just as important. I've used our dear president, Steve, making a left turn, as an example to show you what I mean. I'm using the analogy of mechanical springs here, FYI. 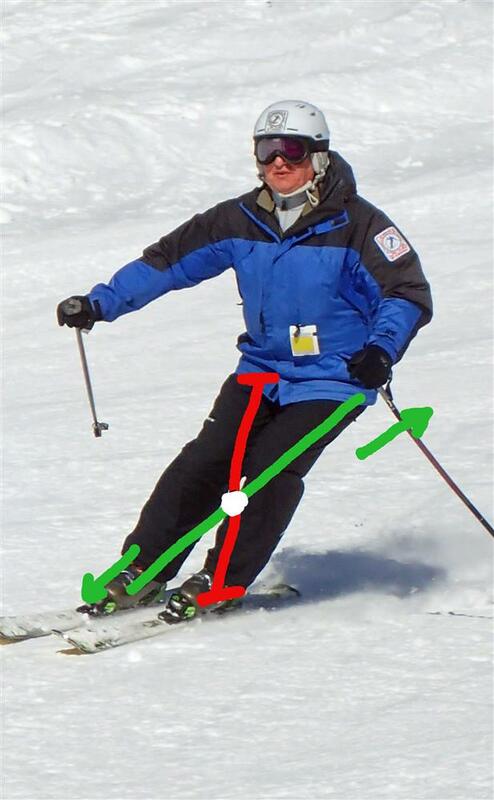 The red line defines one spring of the X—it shows that the inside left ski and the outside right hip are biomechanically connected. In a properly aligned stance, your outside hip stands over your inside ski, especially if you are carving. And I mean really and truly the hip stands over that foot. See that white dot, pretend that is the center of the X, and the center of each spring..
For the red spring, pretend that it is a spring with both ends compressed toward the center of the spring (the white dot). On a carved turn to the left, the outside hip and the inside ski hold you stable, which is why the red arm of the spring is compressed. It's also the shorter spring. The green spring is where all the action is. It's where you actively apply force at both ends of it. You can see that the inside left hip and the outside right ski are linked at the white dot. And you can see that the green arrows show you that you should press down on your right foot at the same time that you press your left hip into the hill. When you press your hip into the hill, you stop leaning and start applying your weight to the outside ski where it belongs. If you take a close look at the World Cup racers, you'll see the same use of this spring idea, except that they are usually much closer to the ground in the speed events like downhill. Their red spring is way shorter and the green spring is stretched out as far as it can go. As we switch from left turn to right turn, we should ideally expand the red spring at the same time we compress the green spring. When we are able to bring the spring idea into our skiing, a neat thing suddenly happens: our inside half has a job instead of just coming along for the ride. And we are able to use the energy generated in the green spring to jump toward the next turn, as I said in my post just previous to this. Questions? Get back to me please!